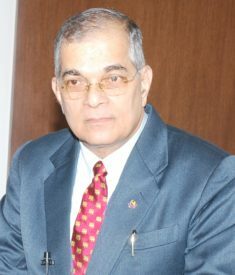 Dr. S. Chandrashekar Shetty is Chief Sight First Technical Advisor, India & Sri Lanka, Lions Clubs International Foundation, Member, Board of Management of Nitte and JSS Deemed to be Universities, Chairman, Peer Team, National Assessment and Accreditation Council (NAAC), Bangalore and Chairman, Advisory Committee of Rajiv Gandhi Institute of Public Health & Centre for Disease Control (A unit of RGHUS), Bangalore. Formerly, Vice-Chancellor of Rajiv Gandhi University of Health Sciences, Bangalore, Sri Devaraj Urs Deemed to be University, Kolar, Vice Chairman, Indian Red Cross Society, Karnataka, Advisor, National Program for Control of Blindness, Karnataka, Director, Regional Institute of Ophthalmology, Minto Ophthalmic Hospital, Bangalore, Chairman of the and Advisor – National Program for Control of Blindness, Karnataka. Dr.Shetty an Ophthalmologist by training, held teaching positions in Government Medical Colleges of Hubli, Mysore and Bangalore. He was awarded with a WHO Fellowship training in Vitreo- Retinal Surgery at Moorefield’s Eye Hospital, London and short training at Eye & Ear infirmary, Chicago, Illinois, Sydney Eye Hospital and Eye & Ear Infirmary, Melbourne, Australia. As Technical Advisor, Sight First program, Lions Clubs International for South India and Sri Lanka since 1991, he has been responsible for developing more than 100 Eye Care projects worth 23 million US dollars. Financial assistance was given for conducting more than 5 lakh Free Cataract Surgeries to the poorest of poor patients in South India and Sri Lanka. He was conferred with Honorary Doctor of Science (Honoris Causa) by Rajiv Gandhi University of Health Sciences, Karnataka and Odessa State Medical University, Ukraine for his contribution to the field of Medical Education and Community Ophthalmology. He has been recipient of many State, National and International Orations, Awards and Recognitions.